Dockmaster, Ian McKay pumping fuel for Tim Hodgdon. Hodgdon Marina now has gas and diesel fuel available. 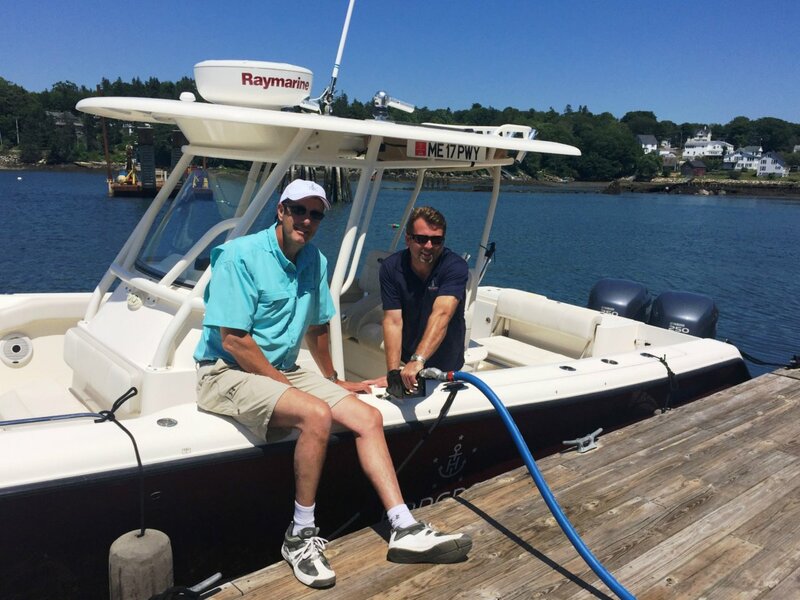 Hodgdon Marina (formerly Wotton's Wharf) in Boothbay Harbor, Maine now has diesel and gasoline available for purchase. The 750 feet of dock space and 500 linear feet of face dock allow the facility to accommodate a range of vessels needing to fill their fuel tanks. Overnight dock space and moorings are also available at Hodgdon Marina. Amenities include 30, 50, and 100 amp power hookups, clean heads and showers, laundry, water, free wifi, and service technicians. Hodgdon Marina is open Monday to Sunday from 7:30 am until 5:00 pm and is located at 85 McFarland Point Drive in Boothbay Harbor, Maine. For more information, please visit www.hodgdonmarina.com.